LittleEcoFootprint is offering our readers a giveaway of a TWO-MONTH SUBSCRIPTION, a value of $58. This giveaway is open to Canada only. I am so pleased to share this review and giveaway from Canadian company LittleEcoFootprint. I’m always looking for great products and companies closer to home, and the LittleEcoFootprint subscription offers the perfect opportunity to get to know even more of them! Here’s the basics of how it works — you sign up for a 1-, 3- or 6-month membership. They deliver a box of at least 5 products to your door each month — healthy, organic, eco-friendly — with some things for you and some for your baby or toddler (box designed around age of your child). Shipping is always included. So I have to admit — my first thought was to expect kind of a sample box — you know, not that exciting? I was very pleasantly surprised when my first LittleEcoFootprint package arrived at my door! Pretty paper and arrangement made it seem like such a fun goody for me experience, while at the same time a minimum of packaging and use of sustainable materials impressed my eco-sensibilities. I also found a lot more than I expected inside! Three good-sized bags of organic treats for my toddler from Canadian company First Food Organics, an absolutely gorgeous growth chart from Canadian company ecojot that will be going up in Bean’s room (so cute it’s going to be tough to write on it! 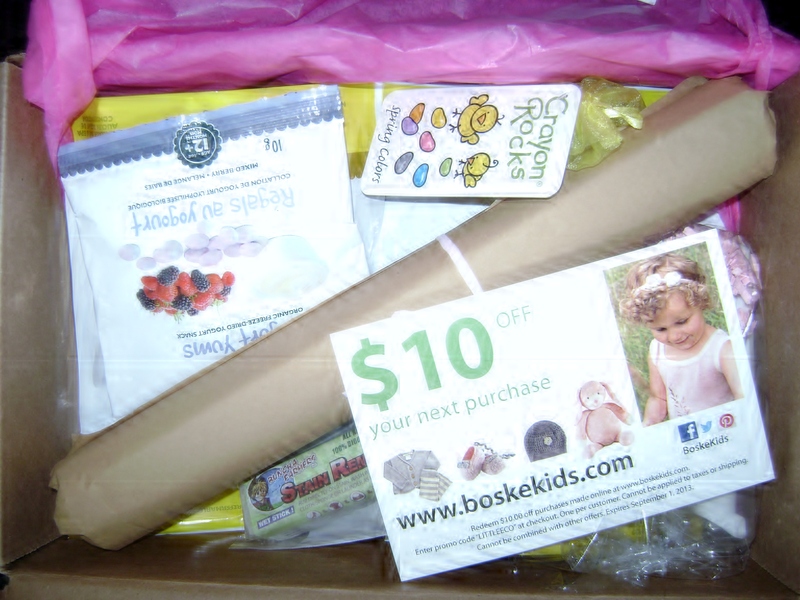 ), a chemical-free stain remover stick that looks like it will last ages, some yummy-smelling body wash and skin care products, crayon rocks for Bean, and a $10 coupon for Canadian clothing company Boské Kids. Really it was quite a haul and a great opportunity to test out new products. But what’s even cooler to me is that the goodies aren’t the only things involved in this membership. 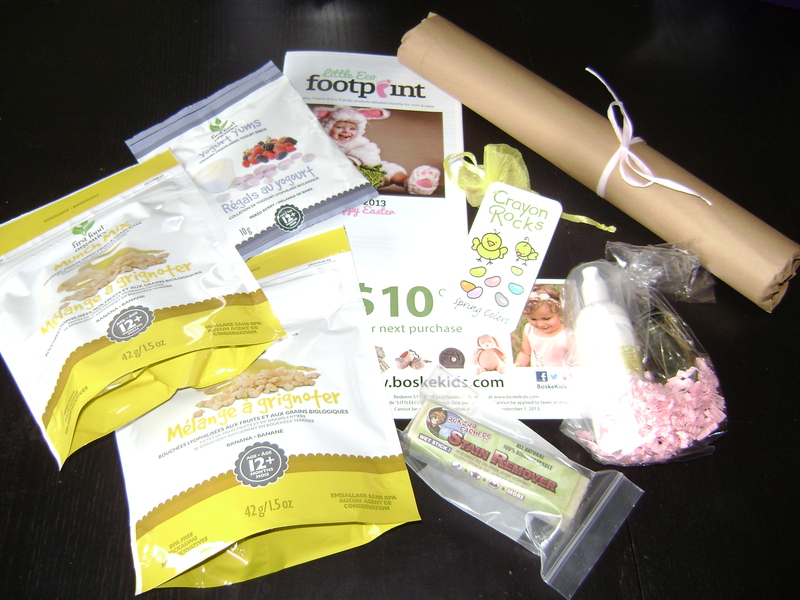 Included in the package was a little booklet full of articles from some pretty amazing experts in the eco-friendly, nutrition and parenting worlds — people like Stephanie Moram of Good Girl Gone Green, Erica Ashmore of Toronto-based Everything Mom & Baby, registered holistic nutritionist Natasha Bell and many more — a wealth of information gathered all in one place. They also offer a blog on their website with even more great info, plus perks like members-only giveaways. LittleEcoFootprint was developed by Canadian moms Lisa & Kristy when they became concerned after the birth of their children (as so many of us do) at the plethora of chemicals and toxins abounding in mainstream baby and kids products. As they began their search for better options, they came up with a way to share all these great new brands with others through the LittleEcoFootprint subscription. It’s obvious to me they’ve worked hard to make this a high-quality, high-value, and fun package for moms traveling along the same path. As for our experience, I truly have no complaints. Bean really enjoyed her treats and loves the crayon rocks. I’ve really enjoyed the opportunity to test out all these new brands, especially as so many of them are Canadian. And I really love getting stuff in the mail, so something like this would be an awesome thing to look forward to every month. 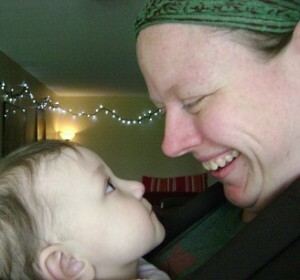 If you’re a mom in Canada, I definitely recommend that you give LittleEcoFootprint a try. Can’t wait to see what’s coming in next month’s box! 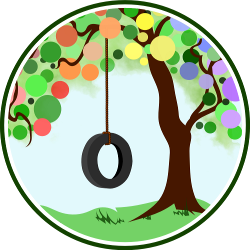 And just for Natural Parents Network and Becoming Crunchy readers, LittleEcoFootprint is giving a $5 discount off the first month’s order from now through May 14, 2013. Enter code NATURALPARENT during the ordering process. For your own chance to win a Two-Month Subscription from LittleEcoFootprint, enter by leaving a comment and using our Rafflecopter system below. The winner will receive a 2-month membership to LittleEcoFootprint. Contest is open to CANADA only. MANDATORY ENTRY: Visit LittleEcoFootprint and tell us one thing you have learned about the company! You must enter your name and email address in the Rafflecopter entry system for your entry to count, after leaving a comment on this blog post. Contest closes May 4 at 11:59 p.m. Eastern Time. I learned that they are Canadian! i love john masters organics products! thanks for the great giveaway!! who doesnt love great mail?! and my toddler would looove this! the company is started by 2 moms. My 1- and 3-yo will find lots to enjoy in the box! My three kids ages 2, 4, and 7 would love this! I love the Re-wood Toys. My 10 month old son and I would be enjoying the box goodies! Both of my boys are enjoying the Re-wood Toys block set. My boys 3 & 1 will enjoy the goody box. I liked the April box. Love to try the ELMA&SANA. Sounds like a great product. 5 high-quality products valued between $35 – $50, for only $29 per month – that sounds fantastic!